Written by Micah Brown On August 15, 2017. Champagne, the ubiquitous sparkling wine that has been a centuries old symbol of opulence. It has been referenced innumerable times throughout popular culture, is a common and often integral part of many traditions and festivities, and has now moved on to being not just a staple of celebration but a statement of personality, especially when it comes to the color. The rise in popularity of a the lightly golden hue is apparent in everything from iPhones to wedding dresses. As with most trends, the uptick in notability is usually due to a desire to be different coupled with encouragement from an outside source (like a celebrity or designer). Arguably the most influential sector driving the demand for color options in our daily lives is the fashion industry. Other sectors follow suit from car companies to home furnishings and even kitchen utensils. There is a desire to make one’s possessions align with their personal tastes. One of Henry Ford’s famed lines, “Any customer can have a car painted any color that he wants so long as it is black.” comes to mind when reflecting on color choice in culture. In Ford’s day companies were not as concerned with the personal preference of customers. Fast forward to today, where you have over forty different colors for a common household mixer, the color options for jewelry are very limited. You have three colors to choose from, white, yellow, rose or green. If you want more options you can move to a two tone piece but even then you still only have three color choices for each element. Variations of saturation can be achieved by changing the alloy of a metal but the hues remain the same. In a recent project for a customer, she had several sentimental pieces that she wanted to utilize in creating a new piece. Most people attach a greater sentiment to the stones in a ring then they do the metal, but occasionally the memories behind the ring make metal just as important. 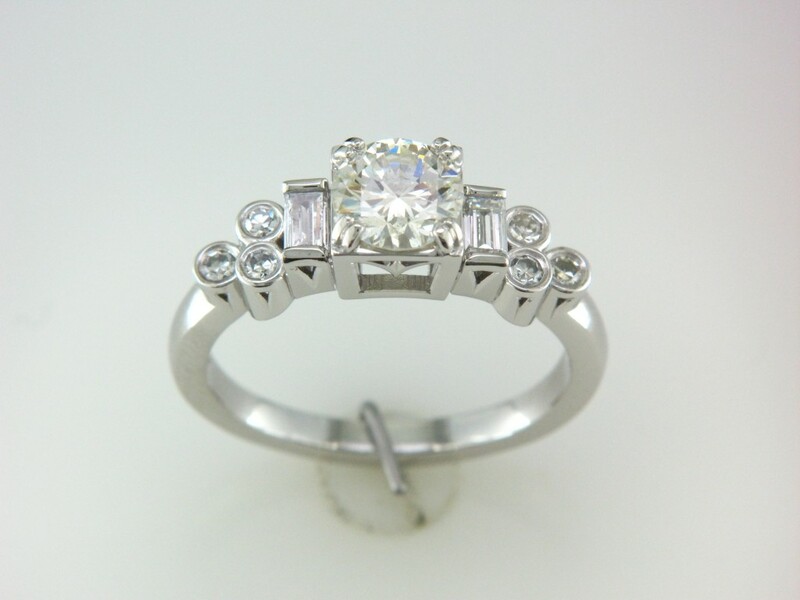 Since this was the case for this customer we recast all of her metal into a new ring. She had some white and some yellow gold of varying karat content. 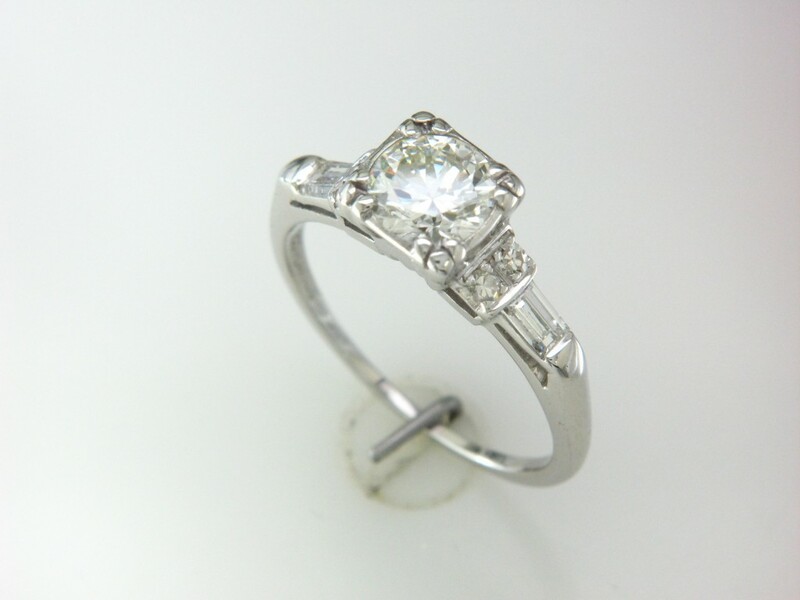 Once we received the casting, set the stones, and completed the final polishing and detail work, we were smitten. We had never seen a ring with such a delicate warm appearance. Immediately we saw a resemblance to the color of champagne. So we called it, “champagne gold”. 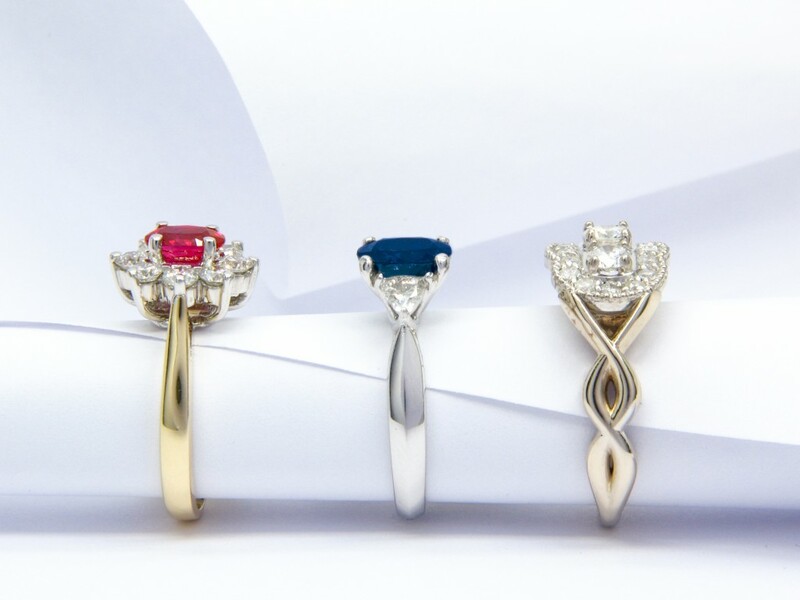 Pictured above and below, on the far right, next to white and yellow gold the difference is stark. There is something truly unique about the color. Not only does the sentiment of the stones and metal from a family’s history make this ring very special, but now the ring takes on a totally new level of intrigue through its characteristic color. So, break out the bubbly and let’s celebrate. Here’s a toast to jewelry that means something more than the price tag, here’s to making something new from something old and here’s to you. Written by Erick Razo On August 3, 2017. During the summertime we love to gather around the grill and eat our favorites meals. Burgers, hot dogs, ribs, salads, desserts, etc. One fruit that you will most likely see at almost every cookout is watermelon, the sweet and refreshing fruit that almost everyone enjoys eating. In case you did not know today is National Watermelon Day, and in the gemological world, we have our own kind of watermelon. No, you can’t eat this one, but you can enjoy wearing it to all the cookouts you attend this summer and all of the summers to come. 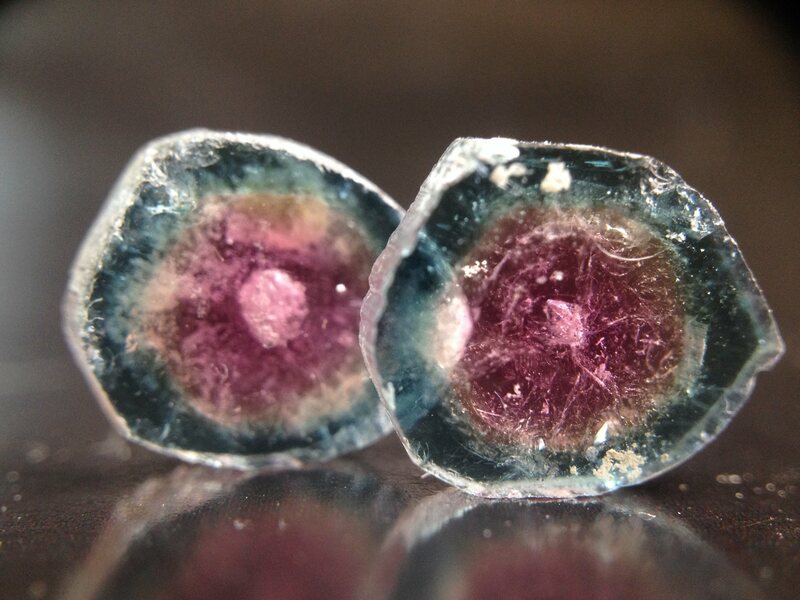 Lets take a look at watermelon tourmaline! 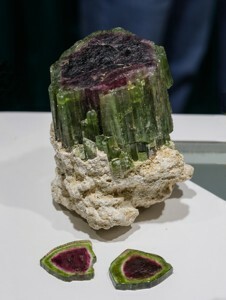 Watermelon tourmaline is an interesting, multi-colored variety of tourmaline. Gems are usually fashioned in thin polished slices to display the crystal’s concentric color rings. If you use your imagination, the green and white represents the rind of the watermelon and the pink represents the sweet fruit. 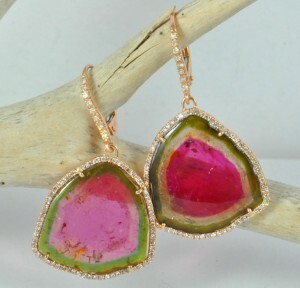 Incredibly, the colors of watermelon tourmaline are 100% natural, a rare occurrence in nature that makes the gem highly collectible. They make pretty, unique pieces of jewelry that can make anyone smile. Stop by our store to see our pair of watermelon tourmaline, and we hope you enjoy National Watermelon Day! Written by Erick Razo On August 2, 2017. The Earth is filled with many wonders, some are vast and mysterious like the ocean, others are tall and full of intrigue like the mountains, and others hide underground waiting to be found. This month we will be looking at a stone that not only is found in the Earth’s mantle, but that can also come from outer space. This month we will talk about Peridot. Peridot, is pronounced “Pair – eh – dough” and comes from the Arabic word faridat which means “gem”. Peridot has been around since ancient times, records indicate that peridot was mined by the Egyptians in the island of Topazos in the Red Sea. 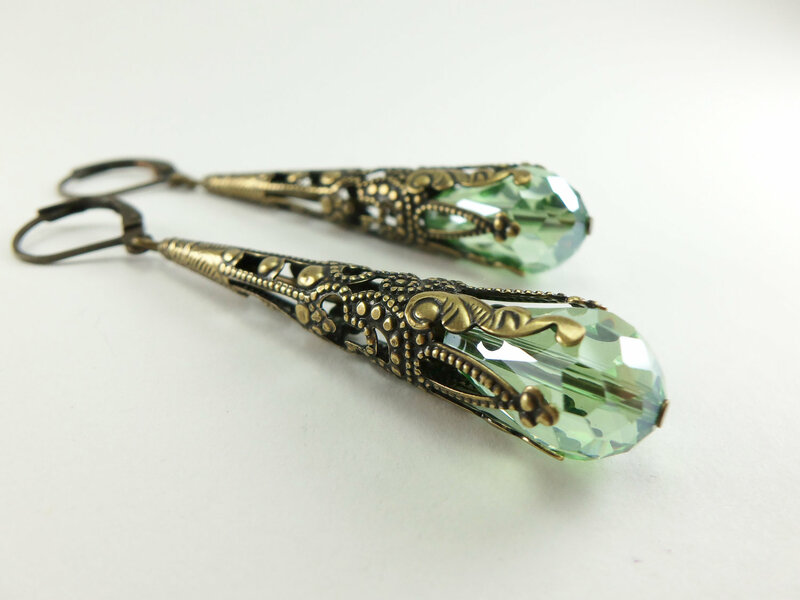 Peridot has always been associated with light by many ancient cultures, some Egyptians would set the stone in gold and wear it on their left hand to ward off evil spirits of the night. Some Hawaiian tribes believed peridot to be the dried up tears of the goddess Pele who was believed to control all the volcanoes in the islands, one of the sources of peridot is actually from volcanoes. Peridot suffered from the epidemic of mistaken identity that plagues a lot of colored gemstones, during medieval times peridot was sold as low quality emerald. Peridot can be found in almost every continent and the quality of peridot is high in almost all of their sources. 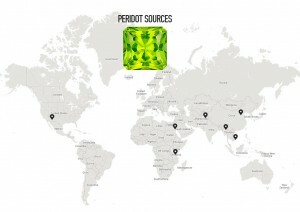 Thailand is one of the main producers of peridot rough and you can find it in almost all the jewelry worn in that country. One of the rarest source of peridot are meteorites from outer space! 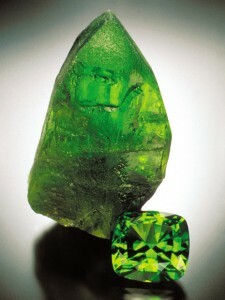 Peridot is the gem variety for the mineral olivine. 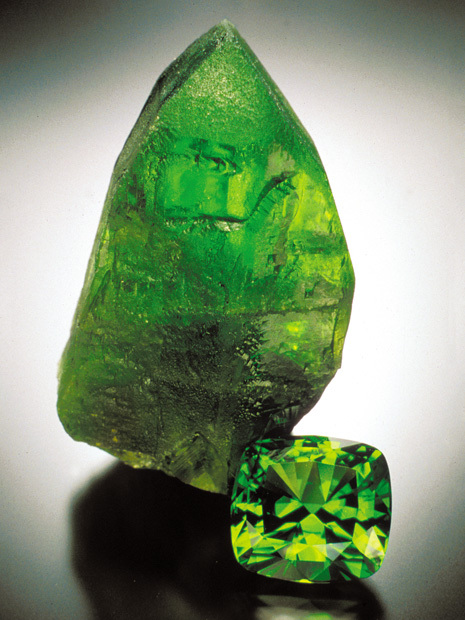 Most quality peridot is found as irregular nodules (a rounded rock with peridot crystals inside.) Large peridot crystals are quite rare and fetch high prices by collectors. 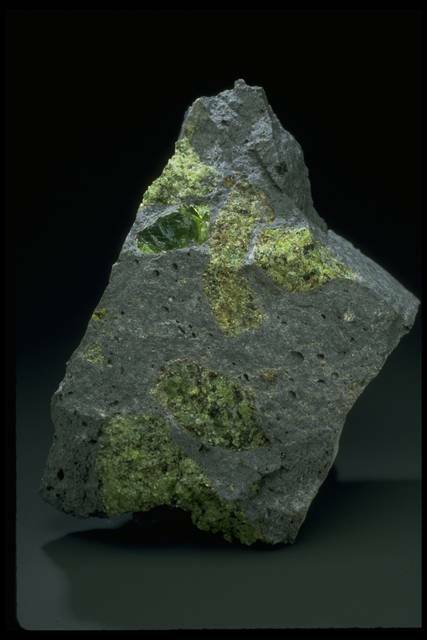 Peridot occurs mostly in basalt rocks, a type of volcanic stone rich in magnesium and iron. Basalt rocks form after volcanic eruptions as the molten lava cools. These rocks are high in iron which helps enhance peridot’s color. 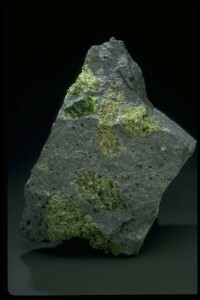 Therefore basalt rocks are ideal for high quality peridot. 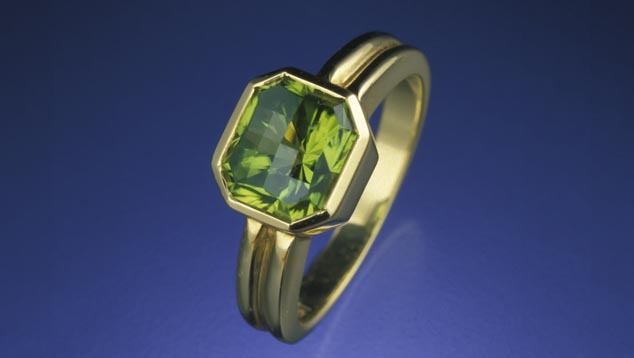 Peridot gives a narrow brown- green to yellowish green to pure green colors, that can be enhanced when set in yellow metal which warms the color of the stone, to contrast the color designers set peridot in white metals as well. Peridot is highly doubly refractive, which means it exhibits a characteristic sparkle, making it highly attractive for designers and consumers. Peridot can be found in necklaces, rings, bracelets and earrings. Peridot has a 6.5-7 on the Moh’s scale. The Moh’s scale of mineral hardness characterizes the scratch resistance of various minerals on an exponential scale from 10 to 0. The top of the scale is Diamond at 10 and graphite at 0. 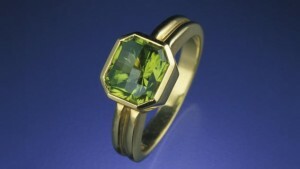 Due to its fair hardness, Peridot is ideal for jewelry wear, but it should not be subjected to heavy every day wear. With the right care and the right mounting, you can create a piece that can last for decades. Peridot’s beautiful range of colors made it desirable for the elite of Europe, during the belle epoque, a period of prosperity and peace right before the outbreak of world war one. 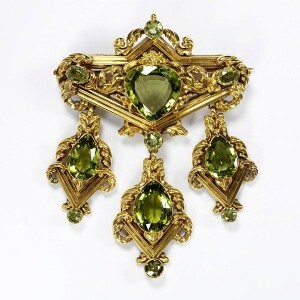 Prince Albert the son of queen Victoria, loved peridot and wore it in almost every single piece of jewelry he owned. The pastel colors, the beautiful doubling and the lore that surround this stone makes peridot a phenomenal choice for your next piece of jewelry. 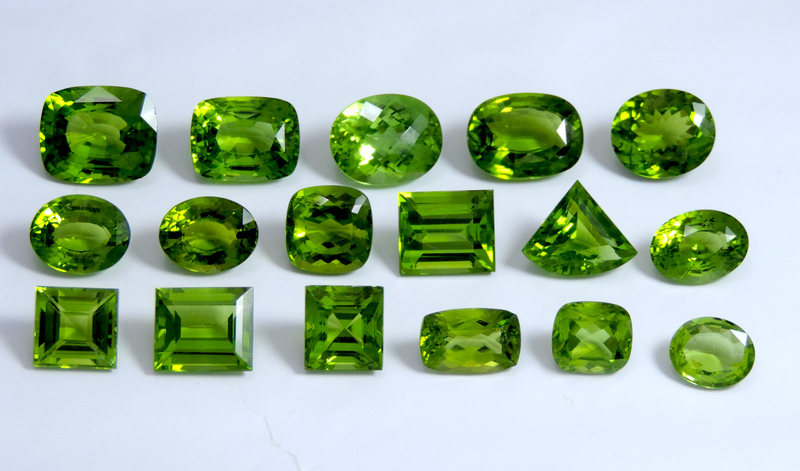 Next time you come in, let us show you some of the beautiful colors of peridot. Written by Micah Brown On August 1, 2017. Over a year before Ray and Megan shared the magic moment pictured above, they brought in a family wedding set to be totally revamped. Years of loving wear had taken their toll on the frail rings. 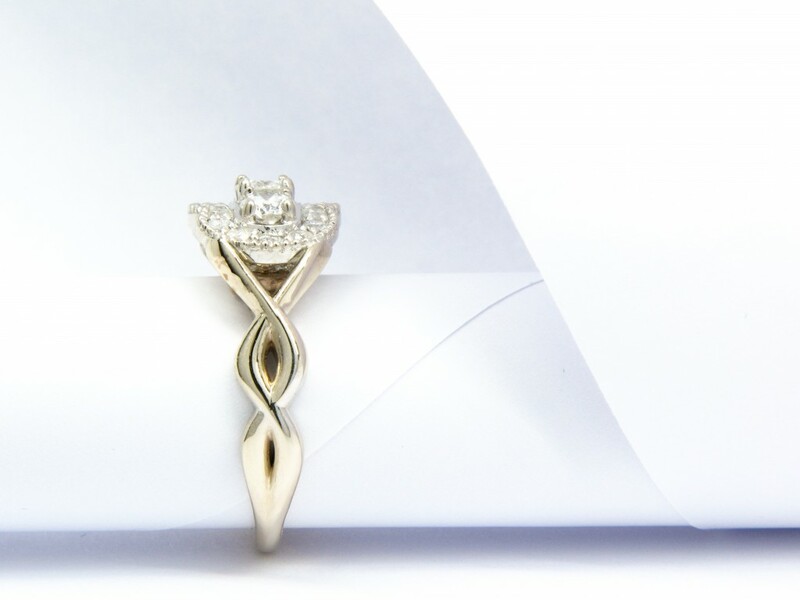 The couple wanted to totally redesign the rings but keep with the spirit of the original piece (shown below). 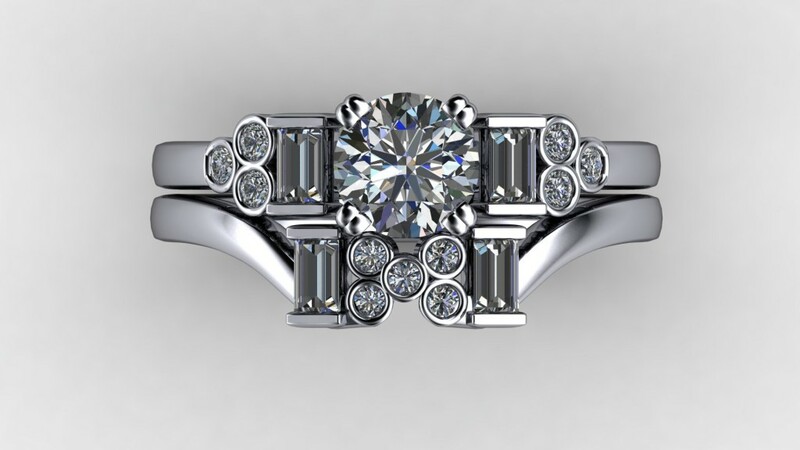 For the redesign, the couple wanted to only use diamonds they already had in the heirloom engagement ring and wedding band (not pictured). The two initial concepts are presented below. 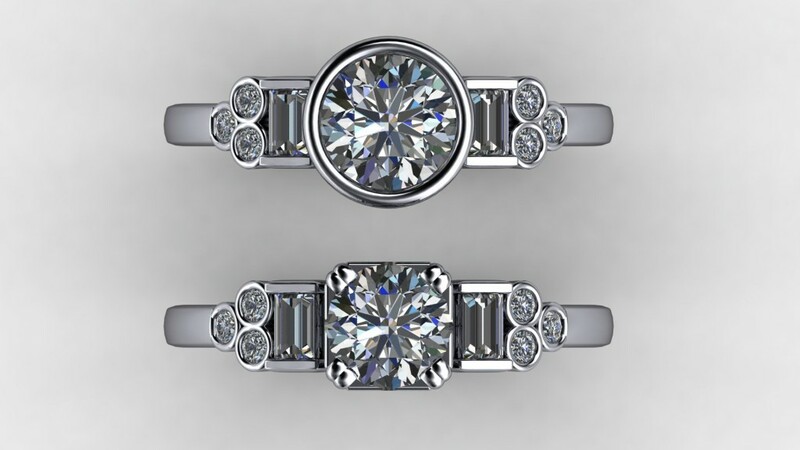 The first was to give a more modern flair to the ring by adding a full bezel around the center stone. The second kept more in step with the original design but was still fresh and new. The customers decided on the final concept below. 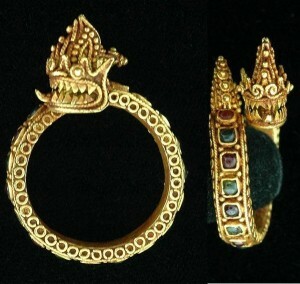 Which utilized every stone they had available from the original set. To insure that the piece would last a lifetime and be able to be passed on to future generations, Platinum was the metal of choice for Ray and Megan. After a few weeks of patience, as the engagement ring was produced, the day came for Ray to come and pick up the new heirloom. To say he was thrilled was an understatement. The completed piece thoroughly exceeded any expectation that he had garnered from the computer generated images that were provided to him. Several months later we produced the matching wedding band and the couple came in to pick out Ray’s wedding band. 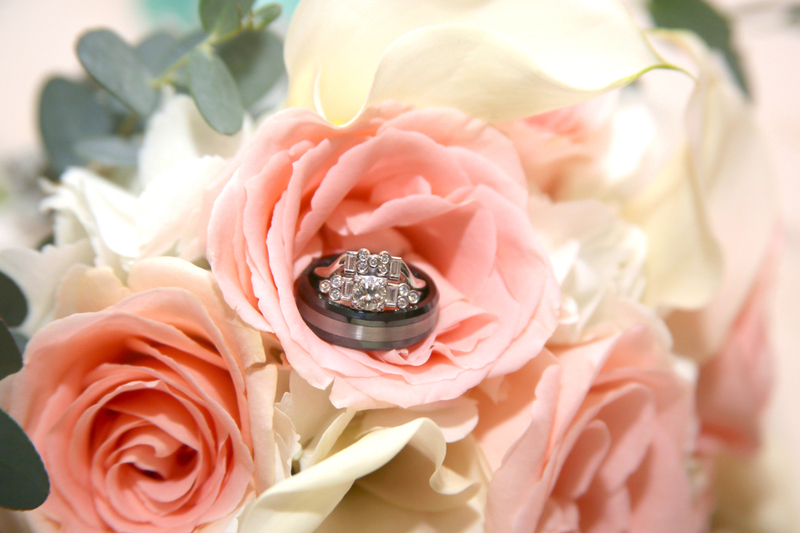 He decided on a ceramic and tungsten band from Lashbrook, one of our favorite wedding band manufacturers. 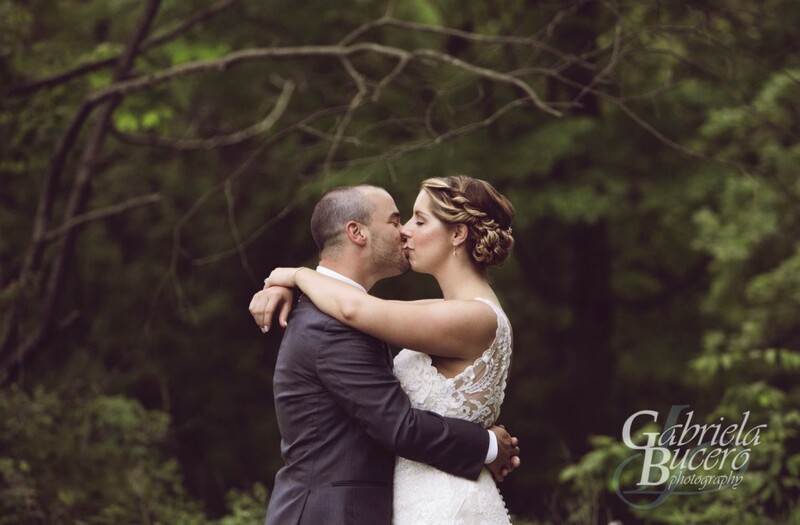 After their wedding, back in May, they send us a few pictures from their wedding by NY based photographer, Gabriela Bucero. Written by Erick Razo On July 17, 2017. When you talk about love, what color comes to mind? You probably said red right? The color red is often associated with our most intense emotions—love and anger, passion and fury. 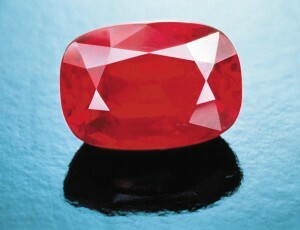 In the gemological world there is a stone that presents us with more beautiful shades of red than any other gemstone. This month we will be looking at the stone that many have called “the most precious stone created by God,” we will focus on Rubies. Ruby comes from the Latin word ruber which means “red,” this inherent color can vary from orangy red to purplish red.Rubies have been around since ancient times and have many myths created about them over the years. 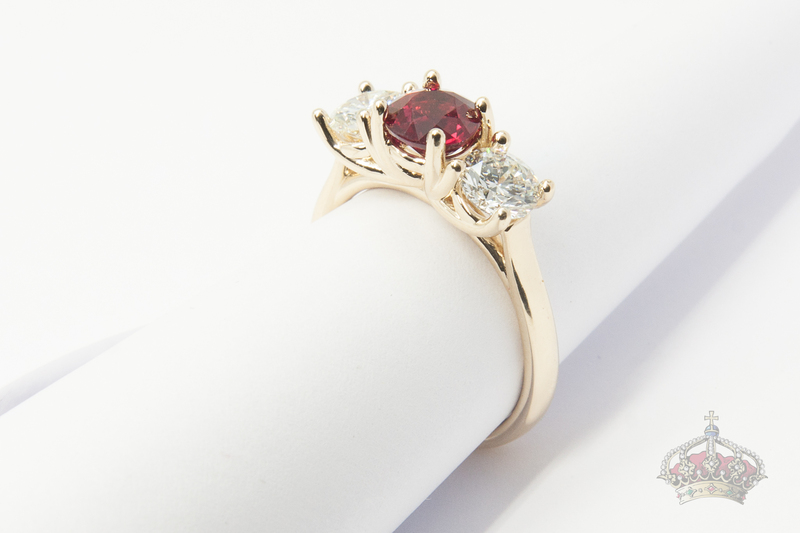 Each region where the stones are found, have made their own lore about rubies. An example of this comes from the ancient warriors of Myanmar, who believed rubies were dried drops of blood, and in order to become stronger and be protected in battle they would put rubies inside their arms to become one with the stone. The beauty of this stone made it be wanted by all the elite of Europe and were usually given to people as sign of power and love. Ruby is considered one of the most historically significant gemstones. Rubies can be found in almost every continent, but the best quality rubies are found in Myanmar, Sri Lanka, Vietnam and the Himalayas. Myanmar has a legendary valley of rubies; Called Mogok and is known for giving some of the most beautiful rubies in the world. Rubies found outside of one of these major sources, tend to be lower quality. 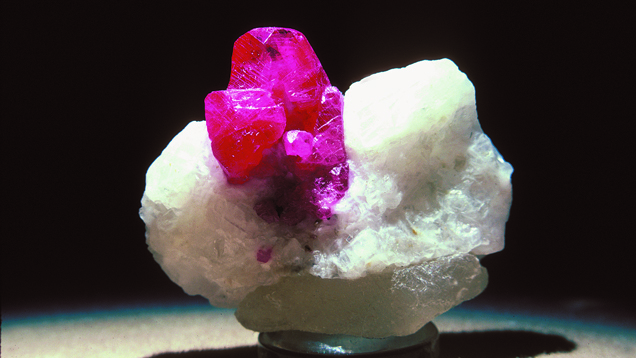 Natural rubies occur when aluminum and oxygen combine to create a compound, along with chromium as a trace element that allows ruby to obtain it’s deep red color. 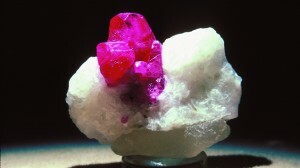 Most quality Ruby grows from marble stones that occur during a metamorphic process. Heat and pressure from mountain formation create the marble stones that are low in iron and high in chromium, which helps enhance the color of the ruby. Rubies can also be found in basalt rocks, which contain a lot of iron, which tends to tone down the color of the ruby. Almost all rubies have inclusions inside them that often dictate how the stone will be cut and fashioned. They often cut in common shapes like round, oval, pear, marquise. When stones are heavily included they are typically cut into cabochons, a smooth stone with no facets, a domed top and a flat or slightly domed underside. Ruby has a 9-9.5 on the Moh’s scale. The Moh’s scale of mineral hardness characterizes the scratch resistance of various minerals on an exponential scale from 10 to 0. The top of the scale is Diamond at 10 and graphite at 0. 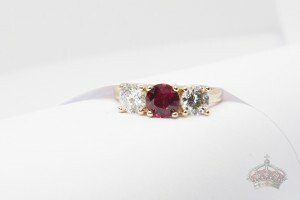 Due to its great hardness, Rubies are ideal for heavy everyday wear. This is why rubies are one of the most important colored gemstones in the market today. The sensation of love is like a fire burning deep within our hearts, yet it does not leave any scars. It gives us a courage that we did not know we had and it shines bright within our hearts. Ruby is a stone that symbolizes love not only because of the red color, but because of it’s impurities and the hardness it posses. The impurities are similar to the people we love, who are full of flaws and virtues, but that is why we love them. We can become entirely different people when it comes to the ones we love, and that hardness that ruby has is similar to how through tough times we can continue to shine bright and love. 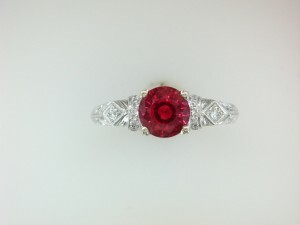 Ruby is the perfect stone for July, so come on in and let us show you the wonderful world of color.